Humidifiers provide many benefits for your baby. They can keep your little one comfortable throughout the night for a more peaceful sleep while preventing issues related to dry skin and congestion. 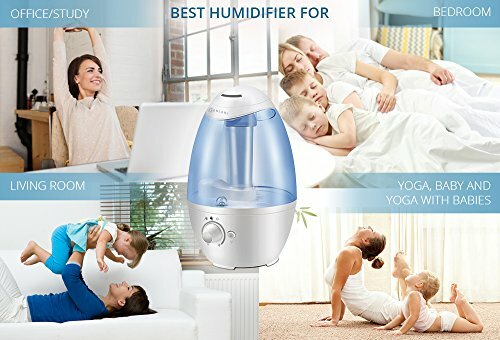 Knowing a little bit about what to look for in a one of these machines as well as the many benefits of using one will help you find the best humidifier for baby bedrooms or nurseries, and one that is best for your individual needs. Dry air can make it difficult for your baby to breathe. Their sinuses dry out which causes the nasal passages to fill, leaving them with that stuffed up feeling. In addition, if you don’t have enough moisture in the air for little ones, their tiny noses will become sore inside. The skin can crack and even bleed. Moisture added to the air creates better breathing conditions. This means your baby is more comfortable. You will especially want a humidifier for your baby on hand when they are sick. Everyone knows how terrible it feels to have the common cold, but the U.S. Food and Drug Administration along with the American Academy of Pediatrics do not recommend giving children under the age of two cold medicines. Fortunately you don’t have to let your baby suffer. A humidifier provides warm moist air that will thin out their nasal secretions so that their nasal passages stay clear. As important as it is for your baby to be able to breathe comfortably, there are many other reasons to invest in a humidifier. Dry climates rob their sensitive skin of moisture. This leads to itchy and sore patches as well as chapped lips. Adding moisture to the air with a humidifier prevents this along with reducing flair ups of skin conditions like eczema. You may even find the white noise created by a humidifier helps your baby sleep through the night, and the extra humidity will allow you to turn the thermostat down so you’ll also save money on your heating bills. • There are two general types of humidifiers available; cool mist or warm mist. Each uses a different process, but both provide you with moist air. Which you choose is a matter of personal preference. • Know the size of the room you need the humidifier for. Measure the square footage of this space. This measurement will help you determine which humidifier is best. Small humidifiers can handle up to 300 square feet while medium sized humidifiers are ideal for 300 to 499 square feet areas. Large models are designed for rooms between 500 and 999 square feet. • Noise levels are important. Some white noise can be beneficial, but you don’t want a humidifier that’s going to keep your baby awake at night. Ultrasonic humidifiers are quieter but you’re trading the use of the traditional fan for a vibrating nebulizer. Most tabletop models are very quiet past the sound of a mild boil or hissing. • Make sure your humidifier can be cleaned easily, otherwise these machines can harbor bacteria. You will be draining, rinsing, and drying it daily along with a deeper cleaning once a week according to the manufacturer’s recommendations. 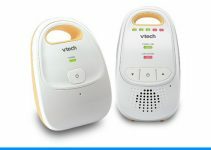 • If your humidifier for your baby isn’t easy to use, you won’t take advantage of its benefits. Along with being easy to clean, you should be able to move it around without difficulty. The tank needs to fit under your sink faucet for cleaning, and the wick should be affordable and easy to replace. Look for a design with easy to read displays and user friendly controls. • Some humidifiers will come with a humidistat. This device shuts the machine down once the desired humidity level is reached. • A timer will allow you to set the humidifier to turn on at a certain time each day. This allows you to turn on and bring the humidity levels up before you need the room. 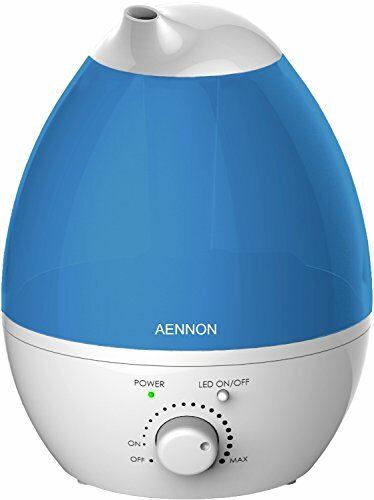 The stylish Cool Mist Humidifier by Aennon blends in wonderfully with your nursery décor. It runs throughout the night with a 2.8 liter capacity that goes for 20 hours before needing refilled. This specific device can be used as a moisturizer, nebulizer, air purifier, and an aroma diffuser as well as a traditional humidifier. The seven color LED nightlight is built in which makes this model ideal for a child’s room. The automatic shut-off is an excellent safety feature that kicks in when the tank is empty, and it is safe to use day or night due to the cool to the touch design. The MistAire Ultrasonic Cool Mist Humidifier keeps your baby’s room moisturized for up to 16 hours with a 1.5 liter water tank. You’ll find that you can easily adjust both the speed and direction of the mist on this machine with the high and low settings so that it can comfortably accommodate your own specific needs. It is just the right size for the nursery, and includes an optional nightlight that provides a soft glow for baby. You can rest assured that it is safe for use around little ones with an automatic shut-off that turns it off whenever the tank is removed or the water level is too low. This is ideal for your baby’s nursery as it runs quietly while providing just the right amount of moisture for comfortable breathing. The three liter water tank makes it suitable for large spaces, even when run on the highest setting for up to 12 hours. If your room is smaller, switch to the low setting for up to 24 hours of run time. The soft nightlight is perfect in a child’s bedroom, and safety is provided by the automatic shut-off. This device turns off on its own once it is out of water, and it doesn’t come back on until it has been refilled. You decide which direction to aim the mist with the 360° nozzle. You can even choose two directions at the same time. This humidifier includes a 0.9 gallon water tank that allows it to help your baby breathe easier for anywhere from 20 to 36 continuous hours depending on the control setting you select. The stream of mist it produces offers the perfect coverage for medium to large sized rooms without leaving any condensation on the floor or tables. You control the mist direction with the 360° nozzle. It is constructed out of premium materials that suppress mold growth, and features a grooved design that reduces the risk of leaks while increasing the resistance to compression. Best of all, this device will run quietly so as not to disturb baby through the night, and the six optional nightlights allow you to choose the perfect glow for your little one. 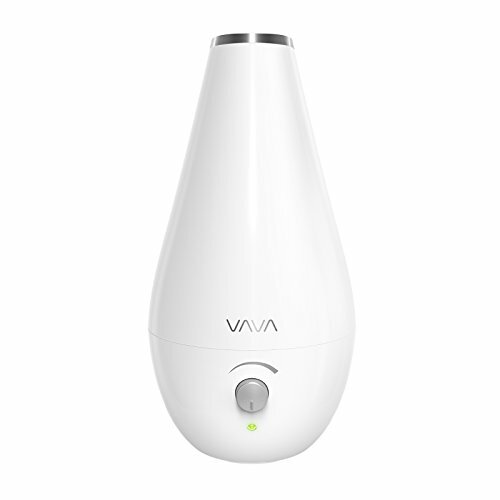 The whisper quiet VAVA Cool Mist Humidifier is a beautiful addition to any nursery. The oval, horizontal shape fits in tight spaces, and the white and silver design has a more modern look than most humidifiers. It easily blends in to any home décor rather than standing out as an added piece of machinery. A dial knob makes it easy to select your mist output settings while the lightweight design is easy to pick up and fill with just one hand. This device will run for seven hours on Max Mist and 13 on Minimum. The 360° nozzle allows you to choose the mist’s direction while an LED indicator keeps track of its operation. If the tank is picked up, the machine automatically switches off for added safety. 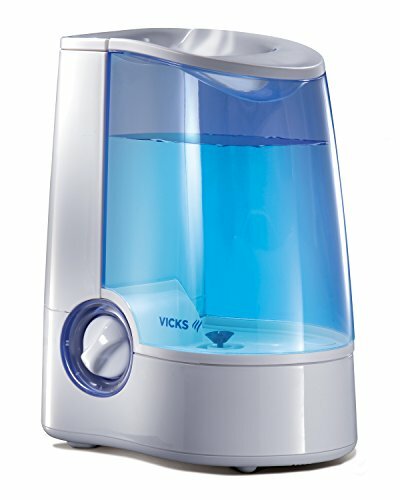 This is a modern humidifier that takes advantage of today’s technology. Power is provided by your computer, laptop, or portable charger through a USB cable. The unique design includes a modern silicone and PP cylinder shape that fits into any stylish nursery. Multiple functions include a mist diffuser and nightlight in addition to the humidifier. It holds 250ml of water which is capable of producing 35ml of moisture per hour for up to seven hours. Once the water is used up, it shuts off automatically to ensure you and baby’s safety. Ultrasonic technology also allows this device to run extremely quietly. 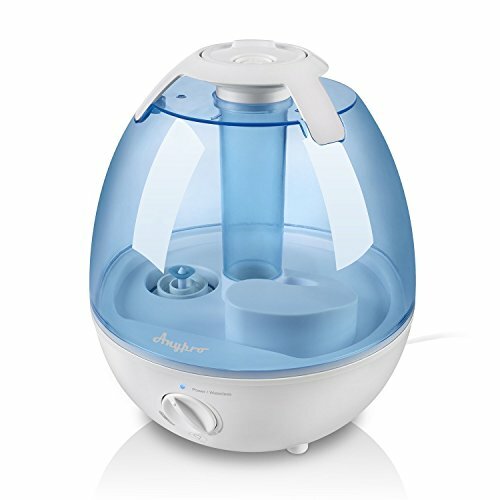 This humidifier is designed specifically with baby in mind. Its lightweight design combined with an USB cable power source allows you to take it everywhere that your baby may go. It even works in the car. All you need is a power source and pure water. It is extremely quiet while running, and an automatic shut-off safety feature is included. It runs for up to four hours on a filled water tank. 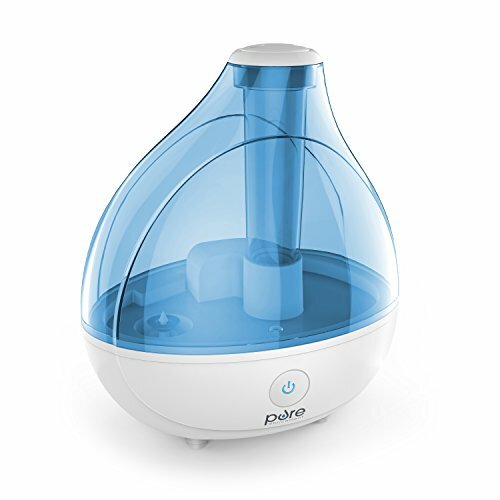 Although it may not be your everyday humidifier, it is ideal for time at Grandmas, day trips, or afternoon naps. A color changing nightlight keeps little ones feeling safe while providing a soft glow for you to use when checking on baby. 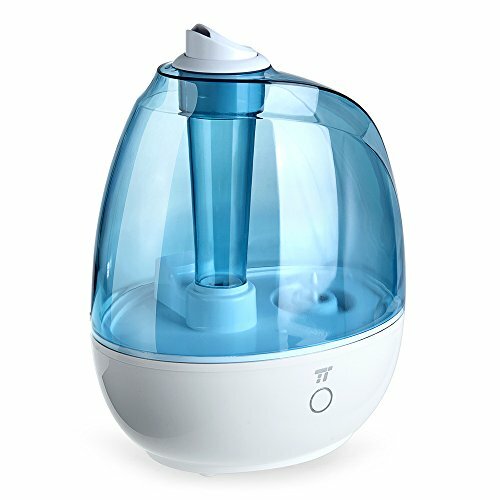 The Taoronics TT-AH0090 Humidifier features a Zero Disturb Mode that is wonderful for use around sleeping babies. You’ll enjoy peace and quiet due to the improved inner structure which makes operation basically noiseless. A two liter tank offers 24 hours of operation time, and refilling is hassle free because of the compact design. The One Touch Control allows you to easily turn the machine on or off with a single touch. An LED display shows you exactly where it is set, and the 360° nozzle allows you to aim the mist in any direction you need it. You’ll also be able to select between the high and low mist modes for a customizable performance according to your own individual needs. 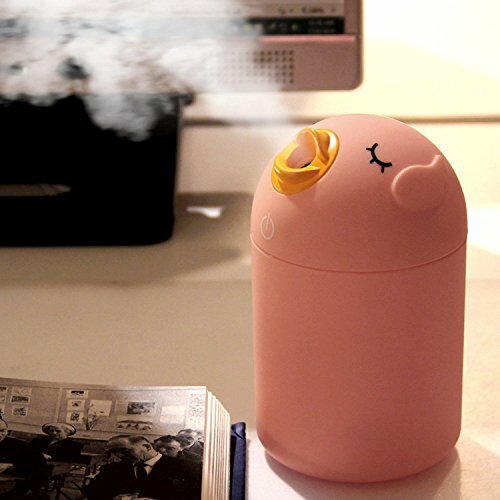 This is an adorable humidifier for babies. The sweet bird design makes it a super cute addition to any nursery, but don’t let its novelty looks fool you. Advanced ultrasonic technology is used to safely and effectively atomize water to produce a fine mist that will moisturize the air without the risk of wet marks on your furniture or floors. It is charged by an USB data cable that comes with it. 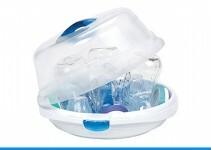 The entire piece is constructed of ABS and BPA free materials. The compact size is perfect for travel, and it can easily be used in the car. Settings are controlled with a touch of the finger in order to produce a quiet mist that won’t disturb baby. 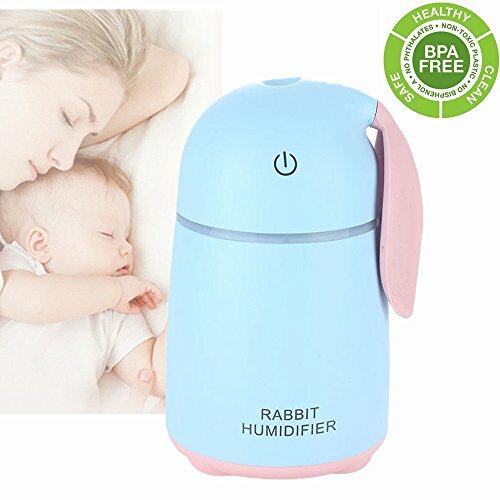 If you are looking for a basic humidifier that will do its job when it comes to making the air easier to breathe, this is the humidifier for you and your baby. The heated vapor is capable of killing 95% of the mold, spores, and bacteria. You’ll achieve soothing relief from cold symptoms when it is used in combination with Kaz Inhalant or Vicks Vaposteam. The one gallon tank can be removed easily by lifting the soft handles. It fills quickly under the average sink, and it gives you up to 12 hours of quiet mist. No filters are required which makes it simple to maintain, and humidity levels are managed with the use of an adjustable knob and dual output settings.